ONE A love cover-ups that also double as dresses. It makes going from the beach to dinner a lot easier. // TWO Wrap-up sandals are a must have item this summer. I love that these are made out of suede so you can wear them into fall. // THREE I bought a pair of Karen Walker sunglasses three years ago, and they are still in great condition. These sunglasses will last through many hot days by the pool. // FOUR This eyelet romper is both playful and sophisticated which make it appropriate for all ages. // FIVE This hairspray is designed to shield hair from heat and humidity. // SIX Every girls needs a striped swimsuit. 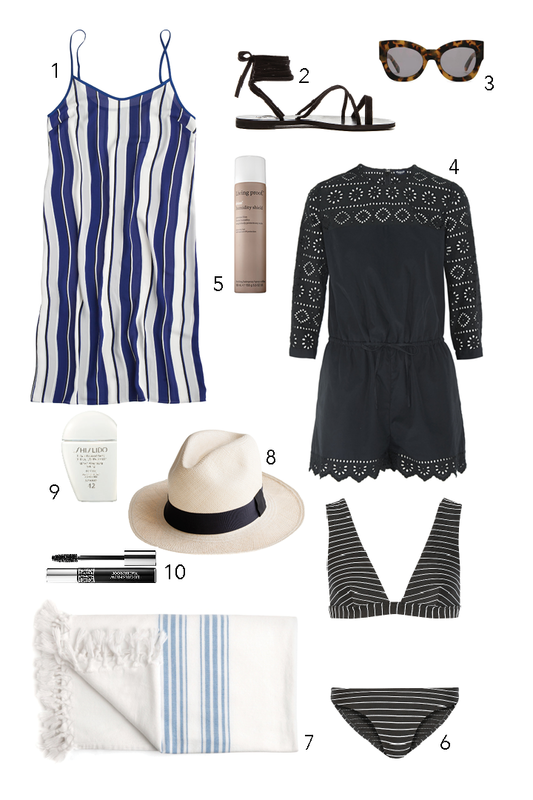 // SEVEN Upgrade your ratty old beach towel with this striped turkish towel. // EIGHT Look stylish while protecting your skin in this panama hat. // NINE This oil-free sunscreen will help keep breakouts away while providing sun protection. // TEN This waterproof mascara will last all day, even through a dip in the ocean.